up initiative system CA spending is pretty locked. \_ Those are not the only two choices. \_ Once again, 100% horseshit. them were easily identifiable as state employees. Do you want me to spell it out for you? not the time to balance the budget. GDP is higher than historical levels. Depression and it was a horrible blunder. Read up about it. \_ Do you understand the similarities? been repeatedly told on the motd. \_ Does capita take in account for unaccounted illegal immigrants? again State economists: Raise taxes, please From the Washington Policy & Budget Center, a letter from economists asking Gov. Chris Gregoire, House Speaker Frank Chopp and Senate Majority Leader Lisa Brown to raise taxes. The Capitol Record Blog, six more economists added their names to the document initially signed by 22 economists in the state. Part of the letter reads: Drawing upon economic theory, we believe reducing government spending will have a more deleterious effect on Washington State's economy than would increasing revenue. Although both cuts in government spending and tax increases have the potential to slow economic growth, cutting government spending would likely have the most immediate impact by directly reducing consumption. Tax increases are less problematic because individual consumers, especially those with higher-incomes, are unlikely to reduce consumption by the full amount of the tax increase. Tax increases are ok because the rich can still buy things? Is that what this line is saying, "Tax increases are less problematic because individual consumers, especially those with higher-incomes, are unlikely to reduce consumption by the full amount of the tax increase." Wouldn't me and mine having more money let me spend more and thus more tax funds? If you cut Government spending, that means that you lay people off and they are no longer able to spend. If you raise taxes, you take money out of people's pockets and they are no longer able to spend at the same rate. Now let's imagine a fiscally prudent government who never hired so many people in the first place. Would these people now be employed in the private sector, or would they be on welfare? February 21st, 2009 at 8:43 am Let's just look at one little part of our state government, the state liquor board, you would think they could make money selling booze, but did you know that there is $421,000,000 unaccounted for? Geting out of the liquor business is a no brainer on saving money but the unions will not allow it, and that folks is just one of many examples of why this state is broke! The special interest are driving our decision makers, it ain't about what is best for the state or the tax payers, it is ALL about what is best for the special interests! February 22nd, 2009 at 10:19 am Sure that's fine citizen, but what are the taxes spent on and how much are they going to take? The answer to that will either make people sad or happy. February 23rd, 2009 at 7:43 am The employees of the state liquor stores are union employees! When you cut government you cut union employees, guess who gives a bunch of money to politicians so that government won't be cut? If you want to get re-elected or elected in this state, having the money of the unions behind you instead of against you is a good idea, if you as a politician is mainly concerned with your future! THERE ARE POLITICIANS WHO ARE MAINLY CONCERNED WITH THEIR FUTURE AND NOT THE STATE'S! February 23rd, 2009 at 3:11 pm Most companies don't expand or locate in states with uncertain tax futures. Any good economist knows that market psychology is a key factor. As a co-owner of a business, I certainly won't expand if I can't predict costs. My concern with the post is Paul doesn't provide any evidence at all about his claims. My next question would be what those professors specialties are. Those historians could focus on economic policy of the past and they could very well have economics degrees. I'd like to know more, but he doesn't provide any other info and he's the only one saying this as far as I can tell. Apparently I was pretty right on the mark with my initial questions. Paul simply looked at their titles and didn't really look at what their degrees are or what their research expertise is actually in. Of course Sound Politics took the post at face value, but I think it's safe to say that there was little to no research done in trying to figure out actually who these people are, he simply looked at their titles and made assumptions. By Sam Taylor Sam Taylor has covered government and politics since coming to The Bellingham Herald in 2006. He is a graduate of the University of Idaho School of Journalism and Mass Media, and interned at four other newspapers prior to moving to Western Washington with his wife, Kathryn. Reprints * Tools Sponsor: * SOCIAL STUDIES Real Reaganites Raise Taxes Conservatism may need to abandon the anti-tax dogma that it adheres to in Reagan's name. Conservatives suspected that something irreversible was happening: that the sheer immensity of President Obama's fiscal and financial interventions may permanently change the size of government and the shape of post-Reagan conservatism. One conservative who understands the potential implications is a curmudgeonly visionary named Bruce Bartlett. In today's Washington, he is something of a voice in the wilderness. Liberals mistrust him because in the 1970s, as an aide to then-Rep. Jack Kemp, R-NY, he helped fashion the original supply-side revolution. Conservatives mistrust him because in the 2000s he broke publicly with President Bush, in a book called Impostor: How George W Bush Bankrupted America and Betrayed the Reagan Legacy. To reclaim President Reagan's legacy in the Obama era, conservatism may need to abandon the anti-tax dogma that it adheres to in Reagan's name. Conservatives and liberals have spent the past 40 years arguing about the size of government. But the size of government has not, so to speak, been arguing about them. As a share of the economy (gross domestic product), federal spending has remained curiously stable. Wars ended and began, double-digit inflation came and went, defense was cut, entitlements swelled, and outlays fluctuated as a share of GDP. Yet, as the chart shows, spending always returned to about 21 percent, almost as if regulated by an internal thermostat. Over the same period, meanwhile, revenues had a comparably strong homing instinct, but the set point was lower: a little above 18 percent. This budgetary stability, or stalemate, or whatever you call it, has been the greatest policy surprise of the last quarter-century. Liberals (and Bush, who expanded Medicare) discovered that, up to a point, a growing economy would let them grow government without destabilizing spending as a share of GDP. Conservatives discovered that, up to a point, a growing economy would let them dig in against tax increases, and periodically cut taxes, without destabilizing revenues as a share of GDP. For decades, everyone pretended to have a profound ideological disagreement about the size of government, but the reality was a comfortable standoff between 21 percent liberalism and 18 percent conservatism. In the end, both sides got what they most wanted: 21 percent spending for liberals, 18 percent revenues for conservatives -- at the politically tolerable cost of a deficit averaging 2 to 3 percent of GDP. This result was handy for politicians and acceptable to the public. In Washington now, the obvious question is: Has Obama ended the 21 percent era? In January, the Congressional Budget Office forecast outlays at 25 percent in fiscal 2009. That was before enactment of the latest stimulus, which increases outlays by more than $500 billion through 2012; and the forecast didn't account for further financial bailouts. 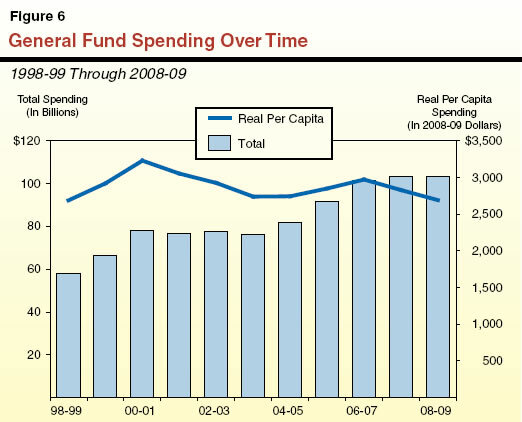 Unofficial estimates take 2009 spending to 26 percent or higher. But CBO is required to make some unrealistic assumptions. The analysts I interviewed believe that spending is likely to be well above 21 percent in 2012. "I'm going to say spending is never going to go below 21 percent again in this country," says Maya MacGuineas, president of the nonpartisan Committee for a Responsible Federal Budget. At the Brookings Institution, Isabel Sawhill, an economist and a former Clinton administration budget official, says, "My best guess would be 24 percent in 2012." In the short run, of course, the stimulus increases spending. In the medium term, many economists expect a deep recession and a slow recovery. That would increase the spending-to-GDP ratio by suppressing growth in the denominator. In the longer term, intense upward pressure on spending will be generated by the combination of Baby Boom retirements -- which begin during the current administration and accumulate rapidly -- and soaring health care costs. The Baby Boom fiscal shock would have arrived anyway, but the recession, the stimulus, and the bailout will have the effect of pulling it forward -- more or less to the present. In which case, the end of the 21 percent equilibrium may already have arrived. In American politics, the dissolution of a 40-year equilibrium is likely to be a pretty momentous event. If they don't get serious about reforming and restraining Medicare, Medicaid, Social Security, and other entitlements, many of the other programs they most care about will be squeezed out of the budget. With his promise of a fiscal responsibility summit and his warnings about the need to confront long-term entitlement spending, Obama seems to grasp what liberalism must try to do, though whether he can deliver is another matter. Many conservatives insist that structural reforms of entitlement programs -- benefit cuts, means-testing, privatization, and so on -- could keep spending at or even below 21 percent of GDP going forward. "We're looking at a massive expansion of government spending," he says. "I became convinced in November of 2003, when a Republican president and Congress instituted a massive expansion of Medicare, at a time when the program was already badly broken and needed to be fixed, that there was absolutely no hope of restraining the growth of spending on those programs." Permanent deficits at 6 percent of GDP would be unsustainable, and the creaky, inefficient income tax is barely able to raise even today's inadequate revenues. The only really workable option, Bartlett argues, is a value-added tax or its equivalent: a broad-based tax on consumption. "It's the only way of preserving incentives and keeping the economy alive." Because it taxes spending rather than saving or investment and is inhospitable to market-distorting loopholes, this kind of tax raises a lot of money at relatively low economic cost. Reaganites hate the value-added tax precisely because it is such an efficient cash cow. Reagan was a conservative who admired FDR, and what he conserved was FDR's welfare state. He understood that the most practical way to make government less economically burdensome was to grow the economy. By taming inflation, restructuring the tax code, and thinning regulatory undergrowth, Reagan made the welfare state sustainable, something liberals had proved unable to do. He wooed middle-class voters away from liberalism by stabilizing the modern entitlement state, not shrinking it. If the 21 percent era is over, then the challenge for conservatives today is to give up on 18 percent government, which the public doesn't want and which conservatives can't deliver. Instead, as Bartlett wrote recently in Politico, "Conservatives would better spend their diminished political capital figuring out how to finance the welfare state at the least cost to the economy and individual liberty." Kent Conrad stood up and produced a little bolt of honesty. "Revenue is the thing almost nobody wants to talk about," said Mr Conrad, the chairman of the Senate Budget Committee. "But I think if we're going to be honest with each other, we've got to recognize that is part of a solution as well." Excerpt from "The Tyranny of Dead Ideas" Mr Conrad's frankness was delivered in the cryptic language of budget experts, and many people might have missed the point. They will probably go up in the coming decade, and the increase will be permanent. Yet we are not paying nearly enough taxes to maintain those programs. Even major changes to the health care system -- the single most important step for closing the budget gap -- will not close it entirely. This is a point on which serious Democrats and serious Republicans agree, even if they do so with euphemism. Fortunately, the coming tax increase does not have to be economically ruinous. Despite all the scary stories you've heard, the evidence that higher taxes necessarily cripple an economy is somewhere between thin and nonexistent. When over the past 60 years did the American economy grow fastest? Bill Clinton briefly took federal taxes to 20 percent of the GDP The real uncertainty is how, in the current political climate, Mr Obama will manage to persuade people that taxes must go up. Otherwise, they will begin demanding much higher interest rates. "Something that's unsustainable, like a dysfunctional relationship, can go on longer than you expect," Mr Orszag has said, "and then end faster and messier than you think." Matt Miller nicely lays out the history of American taxes. He begins the story with Adolf Wagner, a 19th-century German economist who predicted that taxes would rise as societies became wealthier. writes Mr Miller, a journalist and a consultant for McKinsey & Company, "they'd want more of what only government could provide -- a strong military, public order, good schools and assorted welfare benefits, services that private citizens would have trouble arranging for on their own." The tax increases to pay for these activities do bring a cost: they reduce people's incentive to work. Taxes rose sharply in the first half of the 20th century, starting from just a few percentage points of the GDP, and the country still prospered. So long as the government spends the money well, the benefits from taxes -- security, education, health -- can far outweigh the costs. To be sure, the federal government is not currently spending its tax revenue very well. wasting billions of dollars each year on health care that doesn't make people healthier. Unless Medicare's policies are changed, this waste will lead government spending to rise to 32 percent of the GDP over the next three decades, from 20 percent in recent years. But an overhaul of the health care system won't be enough to bring that number down to the current level of taxes. Over time, societies will spend more of their resources on services like medical care, since they can already afford basic material comforts. And these services are precisely the sort of service that fall to the government. Think of it this way: A tax increase isn't so much a barrier to a society becoming richer as it is a result of a society becoming richer. To the extent that Mr Obama has talked about raising taxes, he has focused on households that make at least $250,000 a year. But the problem can't be solved just by taxing the rich. That top 1 percent pays only about one-quarter of federal taxes. Once the recession ends, taxes on the not-so-rich will need to rise, too. subsidies for housing, which create an incentive to overinvest in housing. In the end, the ideas aren't just about "tax simplification" or a "flatter, fairer system." The best bet, I think, is a jujitsu strategy: someone will figure out how to convert weakness into strength. We find ourselves facing long-term budget deficits largely because we don't pay enough heed to the future. Leaving our children with a solvent government is less so. But this same short-sightedness can be turned on itself.